Hawaii is a place of surrender. The law of entropy holds dominion here, more forcefully than in other parts of the world. 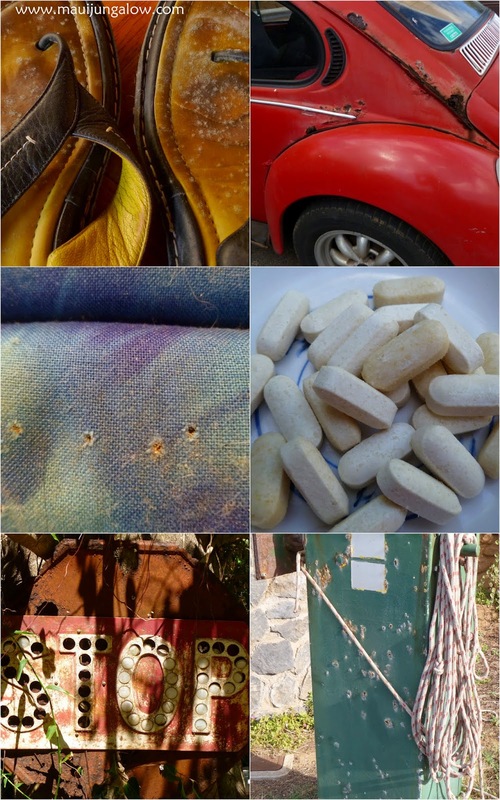 The beautiful, warm climate with its strong sun is so enjoyable, yet incredibly rough on possessions. On Maui, learn to be less attached to your stuff. On the dry side of Maui, there is wind and dust. Red dirt that cloaks everything, blown up from construction sites and agricultural fields. Who knows what’s in the air? The hot Maui sun wears down plastic and shiny surfaces, beats down on your car paint all day. Along the ocean anywhere in Hawaii, the salt air and moisture corrode BBQs, lights, electrical wiring, televisions, computers, cars, metal surfaces, modems, you name it. The salt air leaves mineral deposits on your windows. You will have to constantly replace everything, which is why only the very rich live close to the ocean. Remember, rust never sleeps. The many faces of entropy on Maui. Entropy is King and Humidity is Queen. The paved roads quickly develop potholes from the interaction of the sun and the rain. Entropy is King, Humidity is Queen. Nature takes back things quickly in Hawaii. Things want to change, things want to become dirt. Bugs want to be eaten by geckos that want to poop, and the poop wants to become dirt. Spiders weave webs that disintegrate and become dust that ends up in the dirt. Leaves fall from trees and build up layers of humus (organic matter in the dirt), and havens for worms. Haiku, where I live, is the epicenter of Maui entropy. The beautiful leather purse that was tucked in the corner of the closet (and that you forgot for 2 months) now has mildew stains and wants to become dirt. The clothes you haven’t worn for months in your closet stick together and smell like the inside of old shoes. The cardboard boxes you stored outside in the shed have become a soft nest for the jungle rats. Batteries in your flashlight have leaked. The designer outfit you bought has termite holes. The ants are making colonies in your treasured porcelain figurines in the cabinet. The geckos are short-circuiting the electrical wires in the AC, if you even have AC. The bugs and bug poop have stopped your hot water heater from working. 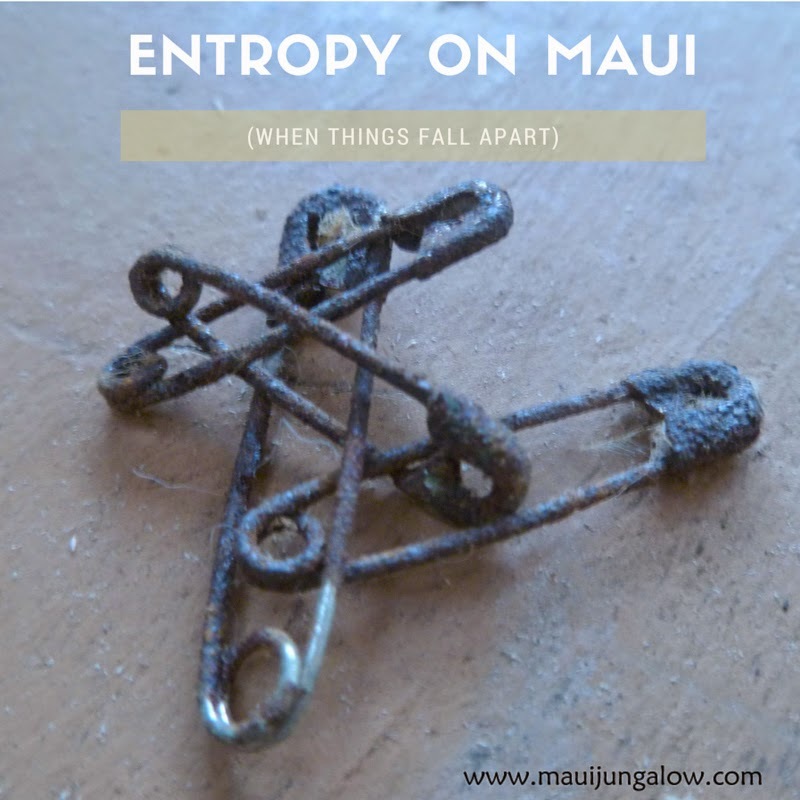 On Maui, learn to surrender to entropy! If you are storing things that might be useful one day, give them away. If you have clothes you hardly wear, give them away. If you have family heirlooms, maybe you should let someone else in a drier part of the world store them. If you have cooking spices or nutritional supplements and vitamins that you don’t use often, store them in the freezer or the fridge. If you are buying huge rolls of aluminum foil from Costco, share them, or store them high up, in the driest part of the house. Like above the fridge. (If you live in a drier part of the island, this may not apply to you.) The humidity in Haiku ruins aluminum foil stored for too long. If you have WD-40, spray it on everything. Just kidding! If you store canned goods, they may develop rings of rust on your shelves. Replace your futon or your bed mattress frequently if you live where I do. Dehumidifiers and small heaters are very useful items. when stored too long in humid locations. Reynolds told us to recycle it. Related post: Ewww! 10 Not So Fun Things in a Maui Jungalow. This is a great perspective on only cherishing those things in life that rust and moths cannot destroy--the intangible and eternal things that give us greater joy than temporary possessions. It definitely makes one let go of things. I love this post. We have a place that's subject to salt air and I absolutely understand what you're saying. Super post. Puts those possessions into perspective. I can relate to the hot and dry because that is the way things are here in Southern California. I think in general we all can learn a value lesson about possessions, and realize that less can definitely be more. I enjoyed reading your post. Entropy is king everywhere, but I guess on Maui it has more of an edge :). I had no idea there was a wet and a dry side - thank you for enlightening me. I had no idea aluminum foil could go bad. This was a fun article, Courtney. You're in the zone. Friends of ours is moving back to the mainland for various reasons. The wife told us that it wasn't what they expected. "Everything rusts," she said. I don't think any of the island entropy would bother the Husband and me. I didn't know that could happen to foil. But you're so right. Humidity can be brutal and so can those pesky bugs. Or one's skin gets cracked and rough! There's always something, somewhere... I do have fantasies about desert islands sometimes!